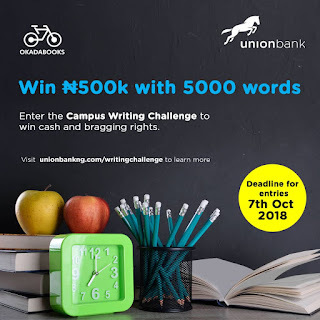 OkadaBooks, Nigeria's top e-publishing platform, has announced the call for entries to the maiden edition of the Campus Writing Challenge. The initiative is sponsored by Union Bank, one of Nigeria’s long standing financial institutions. The Campus Writing Challenge, which focuses on discovering students with raw, bold and creative writing talents, is open to students of tertiary institutions across Nigeria. It is aimed at providing the students with the exposure needed for them to hone their crafts and become master storytellers. Entries for the Challenge which opened on Monday, August 27 ends on Sunday, October 7, 2018. Interested student as are to submit short stories of between 3,000 and 5,000 words through this link. The best entrant will receive a cash prize of N500,000 while the second and third best entrants will receive N200,000 and N100,000 respectively. There will also be a mini award category, including a N50,000 prize for the best short story, an audience favourite award and other consolation prizes. 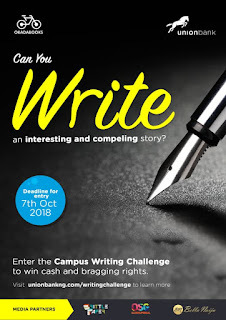 Additionally, the winning, and short-listed works will be forwarded to leading publishing houses in Nigeria for a chance to get them published and jumpstart the writing careers of the winning entrants. Judges for the contest are Chika Unigwe, author, facilitator of Awake Creative Trust and winner of the 2003 BBC Short Story Competition and Abubakar Adam Ibrahim, journalist, author and winner of the 2016 NLNG Prize for Literature.